It’s difficult trying to understand why certain types of paranormal activity occurs around some individuals, and yet not others. It’s even harder trying to make sense of the numerous types of psychokinetic displays put on during poltergeist outbreaks. At least it used to be. It is my current belief that if one is willing to take the time and dig deep enough into such cases, looking into environmental variables, medical backgrounds of the individuals involved, psychological backgrounds, as well as the psychodynamics of the people affected, definitive patterns emerged which are absolutely fascinating. Patterns which explain why specific types of psychokinetic events occur to certain people, while different ones happen to others. Patterns which strongly suggest that these supposedly random psychokinetic acts are nothing of the kind. In reality, evidence indicates they are carefully orchestrated deep within the consciousness of their generators or agents, a.k.a. poltergeist agents. While these events are not consciously mediated, they are deliberate acts of the subconscious or unconscious acting out upon the immediate environment. After forty-four years of work, a fascinating longitudinal pattern has emerged strongly suggesting what’s underlying the nature of most, if not all, poltergeists cases. To put it very simply, WE ARE. Unfortunately for reality television, there are no demons, entities or monsters, just the externalization of consciousness of everyday living people. Well, not everyday living people? These special people are uniquely, neurologically wired so that their body is highly reactive to forces most of us simply ignore. The majority of the human population is highly insensitive to these energies, which is why certain types of paranormal activity is so rarely experienced. Of course, if you watch any of the fraudulent paranormal “un-reality” shows, you might think otherwise? Out of the more than four thousand cases from my own files, there are many that clearly exemplify this theory, but I’ll focus on only three here. Two of the three cases are also the best known of my case files as they’ve received the greatest media attention. They are: The Entity case and the San Pedro case, while the third case is chapter seven “An Irreplaceable Loss: The Life and Death of a Poltergeist Agent” of my book Aliens Above, Ghosts Below: Explorations of the Unknown. As most are somewhat familiar with The Entity and San Pedro cases, let me begin with the case that has received absolutely no publicity whatsoever, and that’s the one that affected the lives of Lisa McIntosh, Barry Conrad and myself from 2001 through July of 2006. This was the last chapter I added to my book before it was published, but not the final chapter. What began as Lisa informing Conrad upon meeting him online that she moved from one haunted house to another while growing up, turned into the Mount Everest of poltergeist cases, that was very well chronicled due to the logging of events by Conrad and myself. What was thought to be just another fascinating RSPK outbreak, resulted in a very steep learning curve in terms of our understanding of the nature of this incredible phenomenon. Lisa moved into Barry’s house from her home in North Carolina in early summer of 2001 and she accompanied us out on her first case in mid-October of that same year. The case was a very minor one as well as being quite old and dormant. While our instruments detected rather high geomagnetic and electromagnetic fields, we did not encounter any phenomena at all. This is quite the norm in such investigations. However, the very next day, poltergeist activity began transpiring around Lisa and Barry, and before it all ended some five years later, they had experienced many occurrences. Between mid-October 2001 and July of 2006, there were probably several thousand separate RSPK events, many were redundant, but nevertheless intense. One of the more violent events occurred when Barry was away on a late shoot and Lisa was preparing for bed. As she was beginning to settle under the covers, Barry’s dog Beau, a gift from one of his many girlfriends, began to leap towards the bed to ensure her place next to Lisa. This dog was very territorial and possessive of her space that Lisa’s presence had now invaded. Although Lisa had a great love of animals, this large, pesky canine was nothing more than a constant reminder of Barry’s last squeeze. Put simply, she absolutely despised that dog for that one simple reason. No great surprise? In keeping with Beau’s territoriality, she leaped towards the bed not knowing that she was about to get a rude awakening as to just how potent some human minds really are. Suddenly, something invisible to the eye, abruptly grabbed Beau in mid jump, momentarily suspending the animal in the air. This was immediately followed by Beau being violently flung backwards away from the bed, into the wall just below the windows in the bedroom. Had the dog’s trajectory been slightly just slightly higher, she would have flown out the second story bedroom window to her death below. Lisa let out a very loud scream and was way too frightened to even move, as there had already been numerous poltergeist incidents in the house preceding this event. She tried calling Barry, but as he was working, his cell phone was turned off and could not be reached. Beau was stunned into semi-consciousness from hitting the wall and laid there quietly for about ten seconds. Upon coming it her senses, Beau hunkered down and crawled very rapidly out of the room, never again to enter Barry’s main bedroom. As shocking as this event was, it really made a great sense in that what we see here is a direct intervention on the part of Lisa’s subconscious mind, via psychokinesis, acting out within her new home (Conrad’s house), to protect her own territory. But wait, there’s much more to this fascinating young lady named Lisa. Lisa’s health became somewhat problematic in that her whole body seemed to ache most of the time even though she was not even forty years old. But as she did not have any health insurance, she simply began consuming vast quantities of over-the-counter pain pills like Aleve, Tylenol, etc. Initially, this appeared to help, but she seemed to have a chronic, low grade fever and as she had an intense dislike of physicians, she initially did not even desire to be properly diagnosed. Some months later, after numerous poltergeist events like doors violently opening and closing, disembodied voices, the sounds of large explosions, telephones incessantly ringing with no caller at the other end, fierce growling voices heard over the phone lines, and even luminous anomalies, the escalating events took a rather odd and ominous turn. While Lisa and Barry were watching TV early one evening in his living room, they heard a disturbance in the kitchen. Both they and the dog got up to investigate unusual noise. 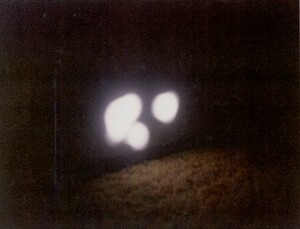 As they entered the dinning room on the way to the kitchen area they observed a really bizarre apparition before them. In fact, this apparition was so distinct and extraordinary that I wouldn’t have even believed it had it come from someone other than Barry and Lisa. There before them was a gigantic, twisting, convoluted 3-D image of the letter “M”, in a dirty, dark brown/black shade of color. What the hell? As Lisa and Barry stood there in utter amazement, this mind-boggling apparition continued its twisting motions, with no apparent sound, aside form that of the dog that was growling at it as it hunched down into an attack posture. Suddenly, the dog lets out a yelp, and runs away with it’s tail between it’s legs. Then, just as suddenly as it appeared, it was gone. Barry and Lisa looked at each other wondering what they’ve just witnessed. They immediately called me to discuss it. I must say, that this is perhaps the most peculiar apparition I’ve ever heard about, period. What in the world does “M” mean, other than Lisa’s last name, McIntosh. But that’s way too obvious to be relevant. Twenty three months later though, the letter “M” became very relevant to both Lisa and Barry, in a way no one could have ever predicted. Lisa finally consented to see a physician regarding her chronic aches and pains. After an exhaustive battery of tests, the answer to Lisa’s malaise was finally known. She’s diagnosed with Multiple Myeloma (MM), and insidious and untreatable form of bone cancer (cancer of plasma cells) that usually only afflicts the elderly. As depressing as her diagnosis was, what’s even more astounding is the “M” relevance here to the apparition her and Barry witnessed some two years earlier. Was it only a coincidence that the apparition they saw was in the form of the letter “M“, or was Lisa’s subconscious mind acting out within her immediate environment trying to communicate what was really going on within her body at the time? As neither Lisa or Barry had ever heard of this illness, which was normal as they weren’t physicians, there was no direct way that such information could have been conveyed to either of them. In my professional opinion, this is matter is so far beyond the point of it being a coincidence, that it’s truly astounding. Unfortunately, Lisa lost her battle to cancer on July of 2006, and shortly thereafter, all the psychokinetic episodes within Barry’s house ceased. Of course they did, the biological generator or agent was now gone. For a far more detailed account of this case, read chapter seven of my book. The next case that displayed the same type of overtly obvious psychokinetic link was the San Pedro case (1989-1993) with Jackie Hernandez. The most blatant and direct events in this fascinating case are the numerous occasions where the RSPK directly attacked Jeff Wheatcraft. On the very first night of our visit in August of 1989, Jeff’s camera was violently pulled from his hands as attempted to shoot some photos in the attic of Jackie’s little bungalow on 11th Street in San Pedro. Jeff’s reaction is pure fear and some disbelief, as he was somewhat of a skeptic when it came too paranormal matters. But the worse was ahead. 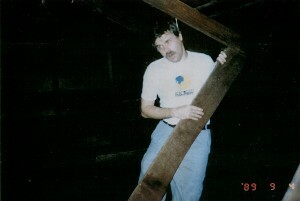 On September 4th, while Jeff was exploring the attic once again, this time with Gary Beihm (a friend of Conrad’s), something suddenly wrapped a clothesline cord around Jeff’s neck and tried to hang him, by lifting his body over a bolt in one of the many rafters. Jeff let out a loud yell as this event transpired. Had Gary not been in the attic with Jeff at that moment, there’s a real good chanced that Jeff would have died of strangulation by that clothesline. Can you imagine the legal complications facing Barry Conrad, Gary Beihm and Jackie Hernandez if Jeff would have died then and there? How could you possibly defend someone in a case like this? Jeff was left with a serious rope burn in his neck that’s clearly visible as he descends from the attic after the attack. Needless to say, Jeff is shocked and for good reason, and backs away from helping us on this case, but not totally. He’s about to learn what a bad judgment call that was. Months later, Jackie finally left San Pedro and moved up to a trailer park in Weldon, CA near Bakersfield. Barry and Jeff, traveled three hundred miles north to visit Jackie as she was still having poltergeist events around her. Yours truly was sidelined for a while as my father had suffered a heart attack and my mother required my assistance at many levels. While at Jackie’s new home, they encountered numerous RSPK events that culminated in yet another, almost lethal attack on Jeff Wheatcraft. Jeff Wheatcraft being hanged in San Pedro, 1989. While playing with a Ouija Board in Jackie’s home, Barry, Jeff, Jackie and several others experiencing table shaking, inexplicable cold winds from nowhere and some rather obscure messages from the board. However, they all paled compared to what was about to occur. Suddenly, Jeff and his chair were levitated up into the air, with the chair falling away while he continued in his upward arc of movement until he was violently slammed into the meeting of the ceiling and wall. Jeff’s limp, unconscious body soon hit the floor. Everyone assumed he was dead. Fortunately, they were wrong. Jeff described a sensation of his diaphragm being compressed and sensing a vertical lifting motion which was soon followed by his back and head being slammed into the wall and ceiling. He woke up on the floor, not really knowing what had just happened to him. What makes these recurring attacks on Jeff relevant in this discussion is how they are linked directly backed to Jackie Hernandez’s state-of-mind at the time. Jackie grew very found of Barry Conrad, and why not. He’s affable, tall, handsome with blue eyes and has come to Jackie’s aid in her time of need. 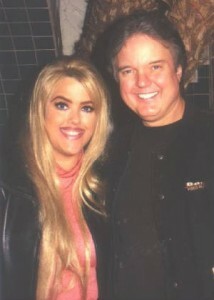 Jackie became very attached to Barry emotionally as he was sort of her rescuer and savior, although she misinterpreted his help as a romantic overture to a single mother, as he very flirtatious . But there was one real problem with Barry as far as Jackie was concerned and it had little to do with Barry himself. The problem for Jackie was that every time Barry was at her home, Jeff was with him, acting as a wedge or impedance to her growing closer to Barry, at least a far as Jackie was concerned. Jackie attempted to correct this “problem” the only way she could….to unleash her RSPK onto Jeff. Thus, it’s no coincidence that Jeff was repeatedly attacked while in Jackie’s presence by invisible forces as Jackie was doing everything within her “power” to assure that Jeff no longer returned to her home with Barry again, and it came pretty damn close to succeeding. At one point during an interview with the magazine show Hard Copy in 1993, I asked Jackie on camera about my suspicions regarding her feelings about Jeff. Jackie readily acknowledged and admitted that my thinking on this matter was entirely correct. However, the producer of this particular story didn’t quite understand what I was referring to here with Jackie, which prompted her to ask me a question: “So you mean that Jackie tells the ghost what to do and the ghost does it, right?” WRONG. No matter how hard I tried to get this producer to understand my theory here, she couldn’t grasp what I was saying. And needless to say, they edited out this entire aspect of the show as it didn’t support their contention that it was all due to a ghost and was far too complex for most viewers to comprehend. There were other major indicators and evidence of Jackie being a blatant poltergeist agent and they are discussed in detail within chapter three of my book and how the localized environment played into the entire case and beyond. To learn more about how and why Jackie suddenly developed this psychokinetic proclivity, read my book or another blog here “Looking A Gift Ghost in the Mouth: The Science of Poltergeists”. It no coincidence that as new tenants eventually moved into, and soon out of, Jackie’s 11th street San Pedro home, many also had run ins with poltergeist activity. Saving the best known of my cases for the last, we’re now talking about the The Entity case from the middle 1970’s. In a nutshell, Doris Bither claimed to have been repeatedly raped by ghosts, where two small one would hold her down while the large, third one assaulted her. As you’ll read in my book, Doris was subjected to frequently recurring episodes of belligerent poltergeist activity, the zenith of which were the alleged rapes and the appearance of the apparition all twenty-five of us collectively observed. Why alleged you might ask? Because we could not prove or disprove that such events ever really occurred as they happened long before we met her in August of 1974. One cannot prove a negative, only a positive. What’s particularly fascinating about The Entity case is that Doris had a family consisting of three sons and one daughter. There was one older, larger, teenage son, while the other sons were somewhat younger and smaller. I think you can figure out where I’m going with this, can’t you? It’s not very difficult to see the Oedipal correlations here, as Doris was a very sexually driven woman, who very likely possessed strong subliminal, libidinous fantasies about her three boys, especially when binge drinking, which, for her, was quite common. These were strong, subconscious projections from Doris who some might say was sexually insatiable, and it’s more likely than not that she deeply desired her three young, strong, vibrant sons to please her in ways she could only dream about. Such an intense incestuous relationship would prove to Doris troubled mind that she’s indeed wanted and needed by the men closest to her, her three sons. Given the background Doris grew up in, where she was intensely rejected and eventually disinherited by her family at a very young age, she was in desperate need of attention and physical love from men at every level. The relationship between Doris and her children was extremely chaotic and dysfunctional to say the least. Such feelings are not that uncommon in society, while the psychokinetic acting out of Doris’s sexual fantasies is VERY UNCOMMON. If you know anything about clinical psychology and/or psychoanalysis, you’ll understand and appreciate what I’m speaking about here. In science there’s something called Ockham’s Razor, which basically means that all things being equal, you always go with the simplest explanation. And in these extraordinary cases, the evidence strongly suggests the causal agent was anything other than a discarnate personality. In a peculiar sort of way, these scenarios are somewhat reminiscent of “Monsters From The Id” as depicted in the 1956 motion picture Forbidden Planet, a loose adaptation of Shakespeare’s “The Tempest”, wherein the indigenous alien residents (the Krell) of a planet within a distant star system developed technology that could translate their thoughts and whims into energy and matter that they then could project anywhere on the planet. Only later, did the Krell discover that their unconscious whims, wants, needs and fears were guiding the process, which eventually led to their own destruction. Does this science fiction plot seem strangely familiar? What’s being theoretically postulated here regarding humanly mediated psychokinesis is pretty much the same as in Forbidden Planet with one glaring exception; we don’t have the technology to create such incredible effects. Although in the real world, it appears as if the interrelationship between certain individuals and their physical environment may serve as a poor man’s substitute. Then again, maybe it’s a good thing that we do not possess such advanced psychotronic technology given our predilection for violence? Remember, real science is where your theory conforms to your data, not the reverse, where you only seek data that supports your theory, that’s quackery. When you watch or here about stories on television dealing with extraordinary, real experiences of violent poltergeist activity, where heavy, massive objects are being tossed around like feathers, what is your first reaction? You probably think it’s the result of an angry spirits or demons, right? The real question here is: Why are you not thinking about HOW these incredible events occurred, i.e., what type of energy, power, force was actually causing this reaction within the environment? When such events are witnessed, something incredible and extraordinary is being demonstrated to us. We are being shown one of nature’s greatest unsolved mysteries. A mystery that has the power to dramatically change who and what we are as human beings for the rest of our existence. Why are we ignoring what’s right in front of our face and burying our heads in the sand? Why are we not asking HOW, as opposed to who? The reason is that arrogant and uneducated media and entertainment sources are dominated by a show business ethic and a profit motive and are subtly manipulating our understanding about such occurrences through ridicule, misinformation and disinformation. The reasons the media so frequently ridicule the paranormal in general deal with some very basic facts. To begin with, all news programs are distorted, embellished and exaggerated to attract our attention so we’ll watch and the network’s ratings go up. Remember, they also live or die by ratings just like sitcoms and dramas do on television. When it comes to the entertainment industry, whether movies or television, is primarily about money and little else. If the journalists who report the news know that what their reporting is essentially little more than a form of propaganda in order to make more money, why should they trust or believe in what anyone else has to say? Ever heard the phrase “If it bleeds it leads”? That’s the essence of news programming, and why the first several stories we see on the news deal with violence, death, destruction and war. How many of you reading this blog know where the term news actually comes from? It’s essentially North, East, West and South, NEWS. Basically, it boils down to this. If we’re the news and we’re nothing more than a pack of lies to make money off of gullible audiences who cannot think for themselves, then everyone else must be lying as well? A double negative for sure. But this is only the primary reason. The secondary reason is that the majority of people who regularly appear on television discussing paranormal phenomena are those people who are simply trying to take advantage of our gullibility in order to empty our bank accounts. These people know as much about what’s really going on in the real paranormal world as they do about nuclear physics. But these are the people appearing on the glut of paranormal “un-reality” shows. This is the real power behind why serious parapsychological research is being totally ignored by television. And speaking of power….therein lies the story behind the headlines. Every known type of energy on Earth; electromagnetism, strong & weak nuclear and gravitation, have one thing in common. When they do “work” in the classical sense such as with F=MA (Force equals Mass times Acceleration), heat is produced as a byproduct due to the second law of thermodynamics, i.e., an exothermic reaction. However, there is another force out there, one that is not officially acknowledged by mainstream science, that clearly does work but does not generate heat in the process, i.e. it’s endothermic. This result of this utterly unique force is currently known as psychokinesis (PK), now referred to in the parapsychological community as mind-matter interaction (they’re trying to make it sound much more scientific as we still do not yet understand it) by some parapsychologists. There appears to be two primary types of PK. At one end is the microscopic -PK that is somewhat volitional for certain gifted individuals. The results of this micro-PK have been observed from experiments with random event generators such as the old Schmidt Box or with new computer systems. Not surprisingly, there appears to be a fatigue factor observed with the manifestation of micro-PK, and the effects are limited to small, extremely low mass objects. At the other end of the spectrum is the macroscopic-PK, more often referred to as Recurrent Spontaneous Psychokinesis (RSPK), poltergeist activity, wherein massive objects, weighing hundreds of pounds are moved about as if their mass and inertia were suddenly neutralized. As discussed throughout the first section of my book, Aliens Above, Ghosts Below: Explorations of the Unknown, macroscopic PK is not volitional, does not appear to result in fatigue of the individual at its locus, and is more than capable of tossing massive objects around in a maelstrom without the detriment of thermodynamics. [although well under two hundred pounds] from The Entity Case (chapter two, “The Real Life Entity Case”) in my book, the amount of heat generated by such mechanical “work” should set the people’s clothing as well as everything else in the room on fire long before they start flying around the room. Look carefully at the second photo here and just try to imagine the energy required to cause this level of visible illumination. By everything we know, the energy required to produce this level of luminosity, should have set the carpet beneath it on fire immediately. But that never occurred. Why? Cold plasma? Not only does the room not get hot, it frequently gets cold! That runs contrary to everything we think we know about energy in the physical universe in which we live. I sincerely hope that you have a fondness for things that go bump in the night as well as enigmatic things that fly far overhead, as there is, almost certainly, a most peculiar interrelationship between the two. for superluminal, interstellar travel. Have you ever heard of Star Trek’s warp drive? Unless you’ve been living in a cave for the last forty fives years, of course you have. Trust me, this is not science fiction or fantasy. This is the stuff of hard, cutting-edge physics. We could be on the verge of building the starship Enterprise if the powers that be were interested in pursuing this line of research. And by the powers that be, I’m referring to those folks who supply the human race with power, as in energy; coal, oil, gas, geothermal, nuclear and hydroelectric. Don’t count on it though, as it would dramatically change the way we all live our lives on a daily basis. Fundamental paradigm shifts don’t come easy, if at all. In what may be one of the most bizarre, synchronistic relationship in paranormal history, the term “poltergeist”, which in German means, noisy spirit, appears to be functionally related to World War II Nazi research headed by SS General Hans Kammler. They (the Nazis) may have inadvertently stumbled across the scientific secret underlying much of the paranormal; a way to manipulate time and space itself! Thank god the war ended when it did and the Nazis really didn’t understand what they had discovered as it would have dwarfed nuclear weaponry. For more detailed information on this research read Nick Cook’s book The Hunt For Zero Point and Joseph P. Farrell’s, The SS Brotherhood of the Bell: The Nazis’ Incredible Secret Technology. Psychical research, morphed into parapsychological research with all it’s concomitant nomenclature, and finally, paranormal research, which has been around in one form or another, for one hundred and thirty years. Isn’t there a phrase that goes something like” “All good things come in time?” After more than one and-a-quarter century, this phrase certainly does not apply to this field of research, as there have been absolutely no breakthroughs. At least that’s what we’re made to understand and believe. The proliferation of alleged paranormal reality shows (actually paranormal un-reality shows), combined with the success of numerous books by pseudo-scientific professionals (quacks, to be more precise) in this field, has negatively conditioned the minds of uneducated individuals that there’s nothing more to poltergeists than that of noisy ghosts or angry demons. Right, and I can fly without a plane! That’s odd, I seem to have misplaced my boots and cape? Now exactly where did I put it after I flew home yesterday? However, the truth of the matter is that there have been considerable advances or borderline discoveries in the scientific understanding of poltergeists, and it unfortunately has absolutely nothing whatsoever to do with discarnate intelligence, i.e. spirits or ghosts. In a nutshell, living human agents (poltergeist agents, to be precise) appear to be at the root of this disturbing manifestation of the paranormal. However, these agents are very unique and uncommon, and share absolutely nothing in common with agents who represent actors, directors, athletes, or the intelligence community. Nor do these agents make any money for their fascinating proclivities. If anything, their lives are turned upside down and inside out to be point where they are shunned by friends and families. Often, the isolation of such individuals has had devastating consequences on their emotional growth and stability. Through the broad collection of data over the last forty-four years, numerous parapsychologists, including myself, have stumbled across a most extraordinary correlation between the nervous systems of poltergeists agents and the outbreak of such intense psychokinetic displays. It was believed by parapsychologists that poltergeists were the by-product of excessive hormonal production during puberty and adolescence. While there is a body of evidence somewhat supporting this contention, it appears to be only part of the equation. The evidence suggests that living people are at the core of all these types of paranormal experiences, so much so that the question of discarnate intelligence in this regard may be superfluous for the most part. While this theory is discussed in detail within my book, it should be emphasized here that we (living human agents) appear to be acting as “biological” operational amplifiers, focal planes and wave guides for this unique type of energy, let’s call it zero point energy (ZPE). Moreover, individuals with such uniquely dysfunctional nervous systems, that is, seizure prone or epileptic, appear to be hypersensitive to environmental electromagnetic or geomagnetic anomalies. This acute energetic sensitivity causes these special people to more readily absorb, amplify, mediate, re-emit and direct the eventual manifestation of macroscopic RSPK, a.k.a. poltergeist phenomena. Equally compelling, is the fact that these poltergeist agents seem to be emitting well over one million times the amplitude of their own magnetic field as compared to the average person. While it’s relatively easy to measure our bioelectric field, the biomagnetic field is much more difficult, requiring the use of superconducting coils or sensors, which are not, as yet, available as hand-held portable devices. The instruments we take out on field investigations (low-frequency spectrum analyzers), geomagnetometers, magnetometers, air ion counters, etc., are more than capable of measuring environmental forces, both electric and magnetic. But they are way too insensitive to detect biomagnetic fields for the reason just stated. While the specific numbers may not seem all that important to most, the normal biomagnetic field is measured in microgausss, that’s millionth’s of a gauss. Shockingly (excuse the pun), many poltergeist agents’ we’ve measured are emitting will over 5,000 milligauss, that’s five gauss. Do the math. While the science of neurology already knows that the brainwave activity of epileptics tend to “spike” and “spindle” in ways that normal brains do not, what we’re measuring here is so far beyond the pale that there is no historic precedent to properly evaluate the meaning of this. Although I suspect that such high amplitude biomagnetic fields is what allows these individual’s nervous systems to inductively couple with their immediate surrounding environment therein triggering and mediating RSPK activity. 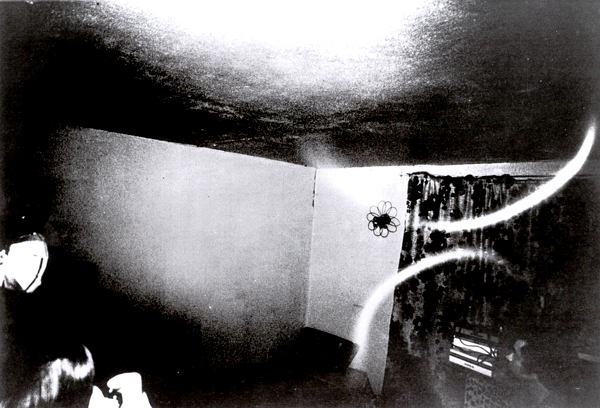 However, while most poltergeist agents appear to be seizure prone or epileptic, most seizure prone or people suffering from epilepsy have never experienced any form of psychokinetic activity whatsoever, indicating this is a unilateral equation for the moment. This strongly indicates that there is a missing or unknown variable here. Perhaps it is as simple as an individual who has a very low stress threshold or that has as a chemically imbalanced brain that has violent electrical surges resulting in erratic behavior with poor coping mechanism? Obviously, this matter is yet to be resolved. What we’re left with here is an example of confluence, wherein there must be several variables working in concert for a given result to occur. This may help explain why many people visit famous haunted locations throughout the world, but only small fraction of such people actually experience any paranormal phenomena. Those small percentages most likely represent the statistical amount of people who have these extraordinarily different nervous systems that inductively couple with such environmental energies. So where does this leave the concept of survival and discarnate intelligence? Well, it might be that information is simply that. Meaning that we, and everything around us, is information, which is energy, which is then matter. Perhaps in the end we’ll discover that there is not only a conservation of energy, but there may also be a conservation of information. My book, delves into this question at great length, trying to lend some reason and method to the need for unraveling mysteries of the paranormal. If you wish to learn more about the interrelationships between matter, energy and mind, read my book to start. You may learn about how parapsychology can one day free us from our earthly confines and allow us to trek to distant star systems. Who knows, maybe such breakthroughs will forever free us from all forms of conventional power? One last thought here as we’re dealing with new types of forms of energy. There is no such thing as “free energy”, that is an extreme misnomer. Even when we have the breakthrough of discovering how to electro-mechanically tap into/access this endothermic, zero point energy field, someone must build and construct these new power sources or reactors. While others must distribute and sell them. Each part of this equation must be paid for by someone. So even when we have limitless power without heat and pollution, we’re going to pay for it, just as we do with everything else in our world. While not free in the literal sense, the freedom the human race may achieve through the discovery of this new source of energy, will in essence free us from our dependence on non-renewable energy sources that are slowly destroying the life we presume to be free. Only time with the necessary dedicated research and development will tell. If we fail at this task of technologically evolving through such new knowledge, we then have no one to blame but ourselves and the future of all humanity for not making us pay more attention to these matters NOW. In fact, they are paradoxical in the extreme. In the primary featured photo you see Doris Bither on her bed, sitting under what appears as a brilliant arc of light framing her below. No one during our investigation saw anything vaguely resembling this. What we all visually perceived at that time were large, brightly luminous, balls of lime green light rapidly flying about the corner of the bedroom where Doris sat on her bed cowering in fear at the incredible luminous display around her. 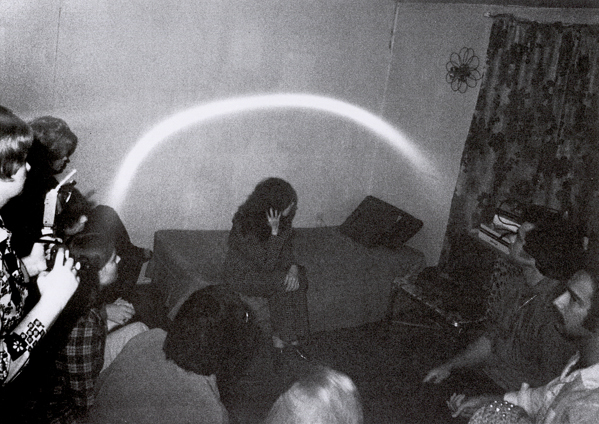 In this second photo, is an extraordinary image of luminous arc over Doris Bither’s head. We did not visually observe this arc. In all likelihood, the reason an arc was captured here is probably because we weren’t shooting fast enough in terms of our shutter speed and therefore the resulting image was essentially a time-lapse shot, similar to what occurs if you take a time exposure of stars at night without a moving platform…you get streaks. But what’s really extraordinary about this particular shot is that if you look behind the arc you’ll notice that the walls meet at a 90-degree angle, which means that if this arc was a projected light source as if by hoax, it would have been bent in accordance with the wall upon which the image would have fallen. This arc is not bent, indicating that the light source was in free space and not a projected image. In the third photograph here there are two inverted arcs present in the frame and yet Doris is not even in the frame. 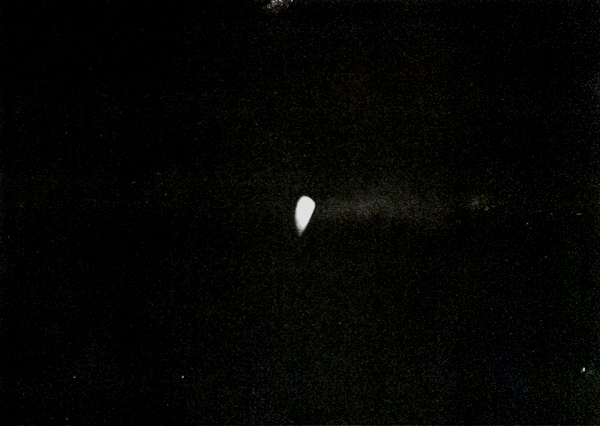 When these intriguing photos were captured, the room was pitch black, illuminated only by the light emitted from the luminous anomalies we observed and photographed with our deep-red filtered strobed 35 mm. cameras. The high point of another particular photo session was when these lights coalesced in the corner of Doris’ bedroom forming into a large humanoid apparition that was visible to all of us, bathed in the same lime-green light. We must have fired off well over one hundred of frames of film from different cameras and with different photographers, yet we could not photograph it. As you’ll read in my book, we all carefully wrote down what we saw before we spoke of it. All twenty-five of us apparently saw exactly the same thing at the same time. Then why couldn’t we photograph it? Maybe because we really didn’t see it with our eyes? Maybe we “sensed” it (a mental image not a visual one) and only thought we we visually observed it? I know this doesn’t make a lot of sense, but if you read Chapter 2 of my book (The Real Life Entity Case), this paradoxical photographic aspect is discussed in exhaustive detail. So does this mean that something in that environment was causing all of us to share some type of collective, telepathic hallucination? What in the hell is that? Contrary to what we see on TV or in films, there is no such thing as a mass hallucination, although there certainly is mass hysteria. So, in the end, what are we seeing in these most extraordinary photographs and what is it telling us about the nature of these phenomena? 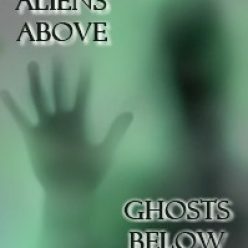 For some theoretical answers, check out my book, Aliens Above, Ghosts, Below: Explorations of the Unknown.